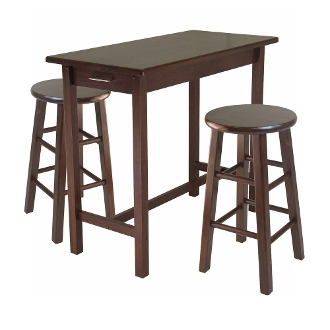 3pc Kitchen Island Table is a perfect to have a quick meal or savor the foo and enjoy your company. Table has a rectangular shape and feature two drawers, one at each end with inside drawer dimension of 11.34"W x 13.19"D x 3.54"H. Table size is 39.37"W x 19.69"D x 33.27"H. Constructed with combination of Solid and Composite Wood in Antique Walnut Finish. Assembly Require for Table. Two assembled stools in solid wood with Antique Walnut finish is 13.40"W x 13.40"D x 24.20"H. Round Seat diameter is 12". Table size is 39.37"W x 19.69"D x 33.27"H.
Two assembled stools in Walnut finish is 13.40"W x 13.40"D x 24.20"H. Round Seat diameter is 12". Made with combination of Solid and Composite Wood in Walnut Finish. Assembly Require for Table.